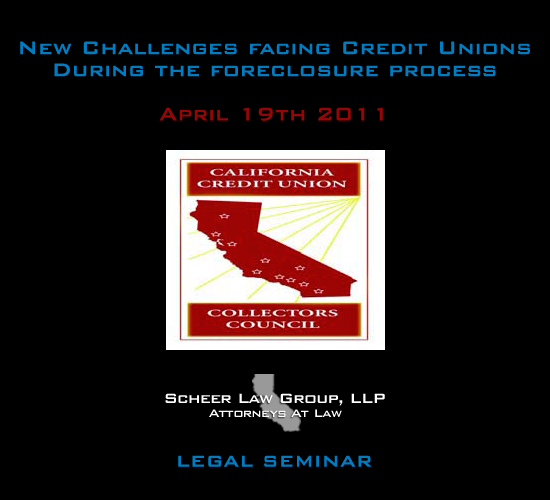 Event: New Challenges facing Credit Unions during the foreclosure process. Mr. Scheer will be covering a number of issues facing the credit union industry including. Loan Workout Issues, Short Sales, Fraud & deficiency liability, Deed in lieu, Borrower Lawsuits challenging the foreclosure Process, Lender Litigation Issues and must more. A must attend meeting!!!!!!!!!!!!!!!!!!! !